Domaine Jean-Luc Colombo 2016 Le Pavillon des Courtisanes Cairanne: Jean-Luc Colombo is one of France’s most talented and creative winemakers. Since the early 1980s, he has been crafting first-class wines from the northern Rhône Valley and southern France. His wines are very different from those of old school winemakers. His philosophy has been to produce fruit forward and elegant wines that are both pure in flavor and expressive of their terroir. 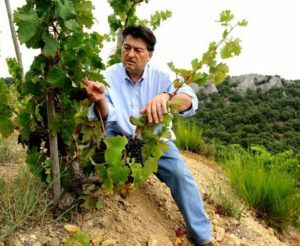 His approach has ruffled some feathers; and he often jokes that he’s a bit of a Rhône outcast since he relies on modern techniques in one of France’s most traditional wine regions. On the other hand, it’s difficult to imagine where the Rhône would be without his commanding presence, as he was among the first group of winemakers to travel outside the area, not only to aggressively market his own wines, but also to tell the story of the entire region. A native of Marseille, Mr. Colombo grew up in a kitchen environment – both his mother and grandmother were chefs – where he developed his passion for food and wine. In the mid-1970s, while studying to become a pharmacist, which proved to be a short-lived career, he developed an interest in oenology and turned his interest and energies entirely to winemaking. In 1986, he purchased 247-acres of vineyards in the Cornas region. From that humble beginning, he now makes his small-production cuvées, as well as a range of other wines reaching down to the Côtes du Rhône. Mr. Colombo’s 2016 Le Pavillon des Courtisanes Cairanne, which received 91 points (100-point scale) from the Wine Spectator, is a red Rhône blend of 80% Grenache and 20% Syrah. It’s loaded with ripe black fruit and beguiles the palate with its soft, silky tannins. This is a wine that’s not too heavy… not too light… and that goes down smooth and easy. 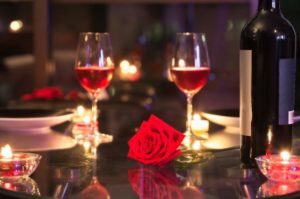 It’s marvelous au naturel; but it also pairs well with a wide variety of foods… so it’s the perfect match for a romantic Valentine’s Day dinner. Priced at $19.99, this excellent vintage is also available through Pennsylvania State Stores. 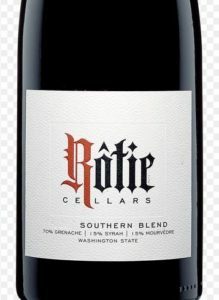 Rôtie Cellars 2013 Southern Blend: The wine label strikes one as definitively French… but this distinctive Rhône blend – 75% Grenache, 15% Syrah and 10% Mourvèdre – surprise, surprise, was produced in Walla, Walla region of Washington State. Since 2007, winemaker and owner Sean Boyd’s goal has been to produce traditional Rhône blends in Washington State. 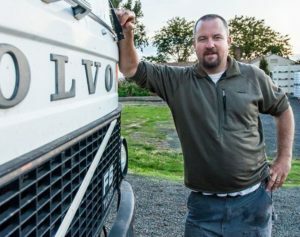 His winemaking philosophy is simple – combine old world winemaking techniques with the highest quality Rhône varietals that Washington State has to offer. Mr. Boyd sources from some of the best and oldest vineyards in the state in an effort to showcase the most elegant blend possible, while ensuring the typicity of the fruit is expressed. Originally from Tacoma, like many winemakers, Mr. Boyd took a rather intriguing path to Rôtie Cellars… Previously working as a geologist for ten years in oil and gas exploration, he participated in his first harvest at Waters Winery in 2004. He began his own winery in 2007, focusing solely on Rhône varietals. And his non-traditional background proved to be a great asset, as this is one winemaker who really knows his soils. Mr. Boyd is convinced that there is no right or wrong way to create or consume wine… He just makes what he loves to drink – French style Rhône blends. His philosophical approach is basically Old World and natural. He believes that great wine happens mostly in the vineyard, and that his main job is to stay out of nature’s way. The Rôtie Cellars 2013 Southern Blend, which recently received 92 and 91 points, respectively, from Robert Parker’s Wine Advocate and the Wine Enthusiast, is certainly delightfully delicious corroboration of Mr. Boyd’s prowess as a winemaker. The Wine Advocate described the 2013 vintage as “savory, medium to full-bodied, supple and beautifully made.” Like its French cousin noted above, this is a wine that’s as smooth as silk on the palate and easily paired with a variety of culinary combinations. Another great choice for your Valentine’s Day table. That being said… its most pleasing attribute may well be its incredible price point. This wine normally retails around the $45.00 mark. However, as a “Chairman’s Selection,” it is currently on sale through various PA State Stores for a paltry $19.99.